Extraordinary. 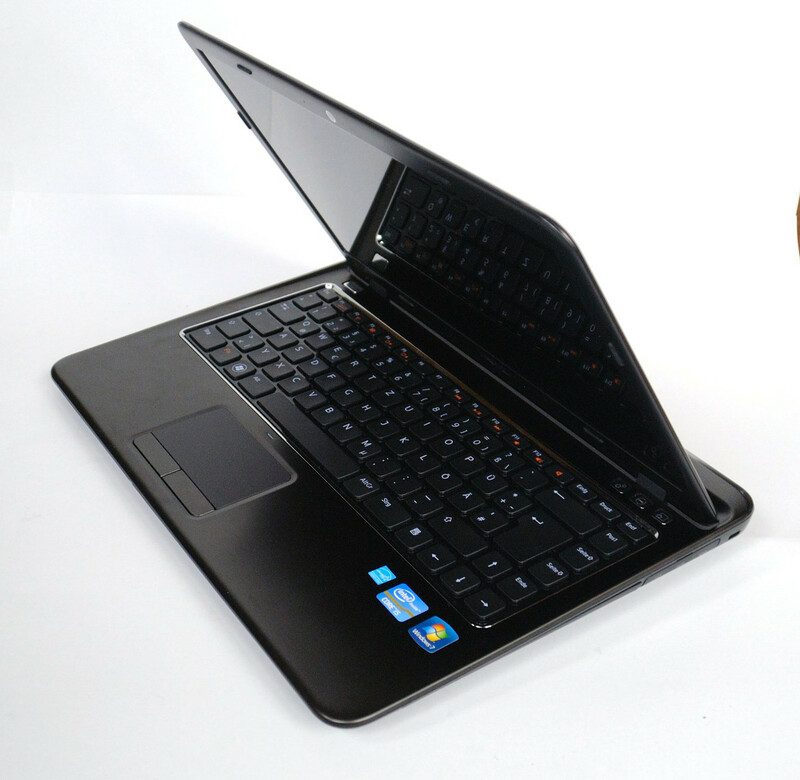 The Inspiron 14z has an unconventional design along with a lot of interesting features. Whether or not this 14 inch notebook with a 13" format powered by an Intel Core i5 2430M could be a success, can be discovered in this review. 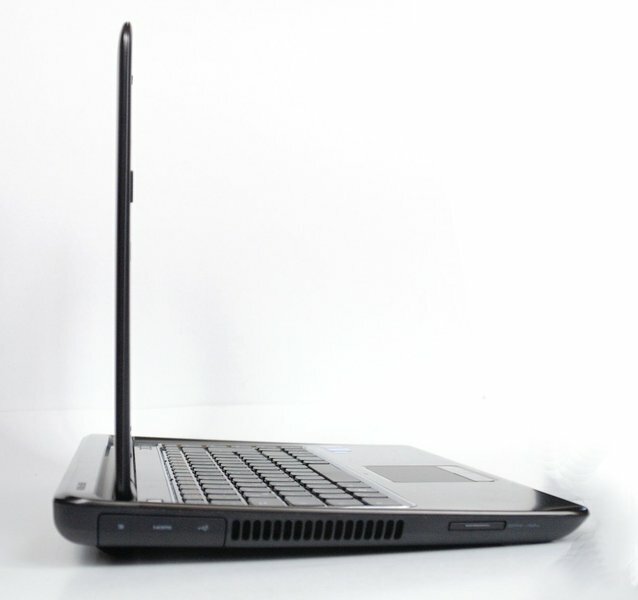 The Inspiron 14z is touted by Dell for being especially thin and light, while also having a lot of processing power. It belongs to the consumer series Inspiron, which provides entry level and mid-range notebooks with colorful designs. Dell describes its especially thin models with the abbreviation 'z', such as for example the thin XPS 15z. Although the latter is considerably more expensive, and has a lot more processing power than the Inspiron. The price in the Dell online shop currently starts from 600 Euros. 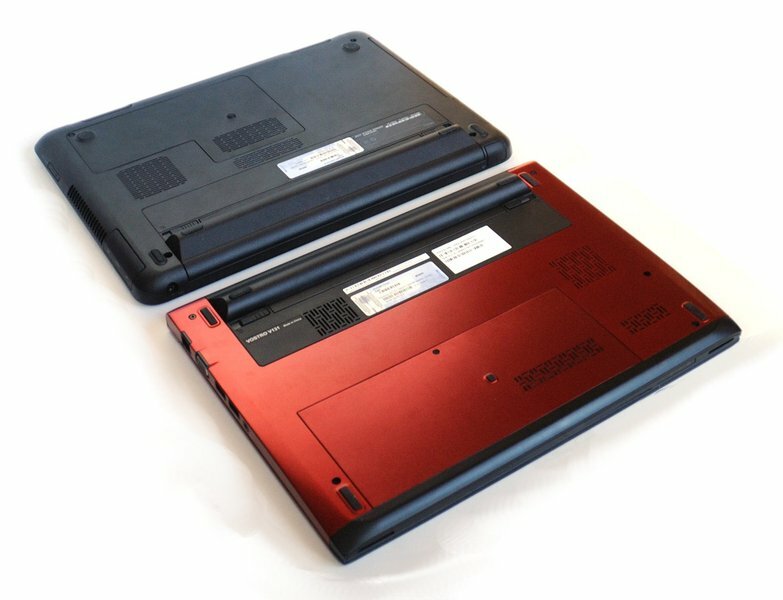 From a construction standpoint the Inspiron 14z has the most in common with the Vostro V131, with which it shares the same keyboard, battery, and AC adapter. 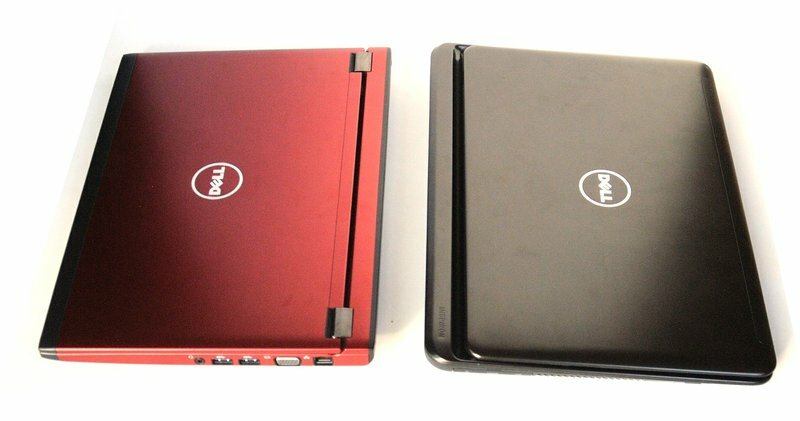 The Vostro V131 belongs to the entry level business series from Dell, and has slightly smaller dimensions, while also being lifted upwards at the back by the battery. 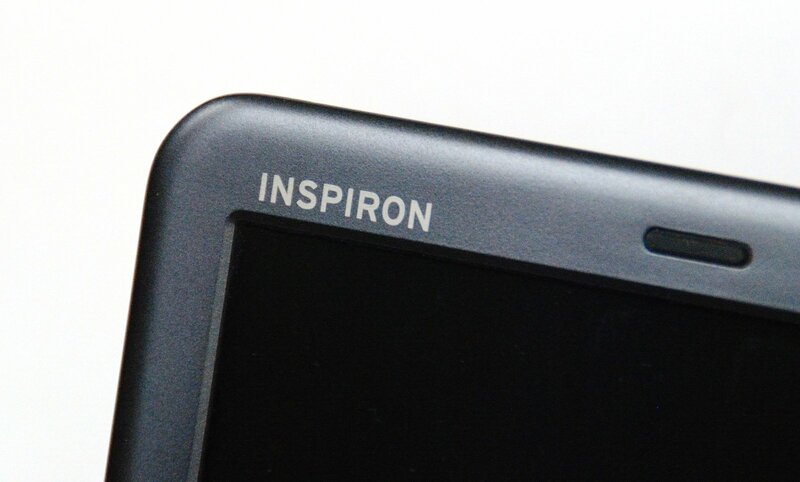 The Vostro V131 however only has a 13.3 inch display, and in this instance a feature that is not explicitly advertised by Dell becomes obvious: The Inspiron 14z has a relatively narrow display frame, and can be classified as a 13 inch device due to its display dimensions. Therefore anyone who is currently looking for a subnotebook, could also take the Inspiron 14z into consideration. The Dell Inspiron 14z has an extraordinary design. 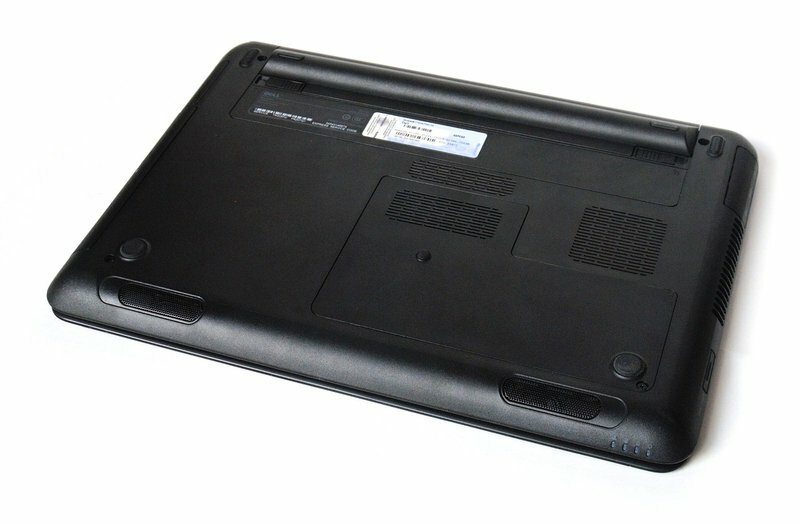 Similarly to newer Vostro notebooks from Dell, the display has been brought forward, and has a bulge behind it which primarily contains the battery. Contrary to the older business series from Dell, which had more pronounced edges, the Inspiron 14z has more rounded edges and corners. The display folds into the back of the base unit, which engulfs the base of the display. Towards the front the display gets wider and closes flush with the base unit. With a maximum thickness of 27 mm the notebook is relatively thin, and is lifted upwards by about one centimeter when the 6 cell battery is attached. When the 4 cell battery is attached the notebook lies flat, and makes a considerably thinner impression. There are currently two colors available: 'Fire Red' and 'Espresso Black'. The latter of which is the color of the device reviewed by us. The display lid and the top surface of the base unit are covered with a dark brown varnished aluminum. The bottom and the frame around the display are made of a matt black plastic. The manufacturing quality of the notebook is mediocre. Although it may be relatively stable, and can only be dented marginally around the optical drive and in the middle of the keyboard, the seams and gaps between different materials are not always completely even. The base unit and the display can be twisted with a bit of force. The hinges for the display are relatively rigid, and hardly wobble at all. In order to do this the base unit has to be held down when opening the display though. 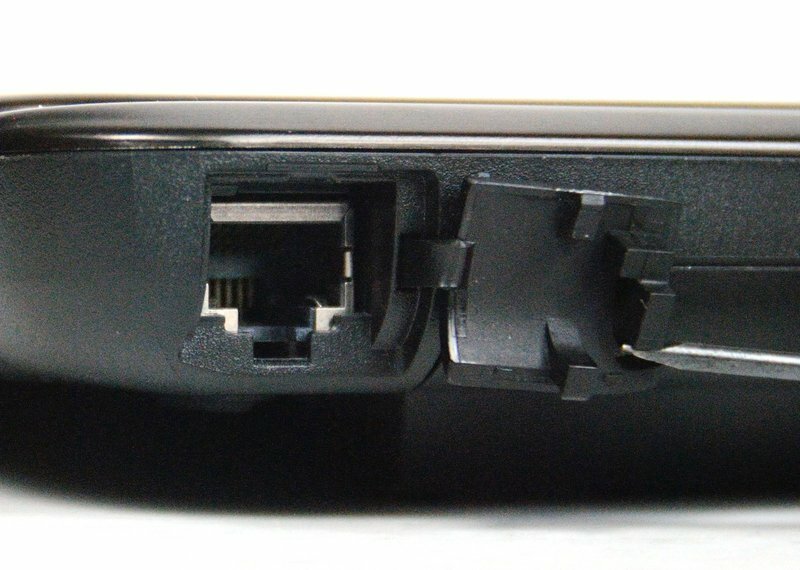 When it comes to the interfaces on the Inspiron 14z, Dell has opted for an unconventional feature: All ports except for the power input are behind plastic covers. Such that it is first necessary to lift a panel downwards or to the side in order to access the interface. This less common practice protects the interfaces from dirt and sharp objects. In addition the notebook has the appearance of being constructed out of a single element, since the sides of the notebook are not interrupted by any gaps. Whether or not this protective measure will have a tangible benefit remains to be seen. Looking at the selection of available interfaces, Dell surprises with the omission of a VGA port, which has been replaced by a Mini DisplayPort. 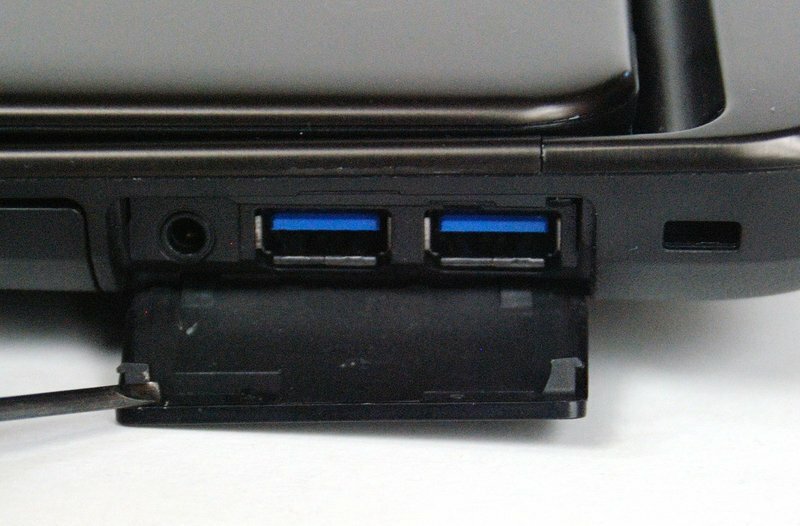 Also on the left side towards the back is one HDMI, and one USB 2.0 port that has charging functionality when the notebook is switched off. Above the air vent there is a card reader for SD, MS, and MMC cards. The back contains the power input, and a Gigabit LAN port. 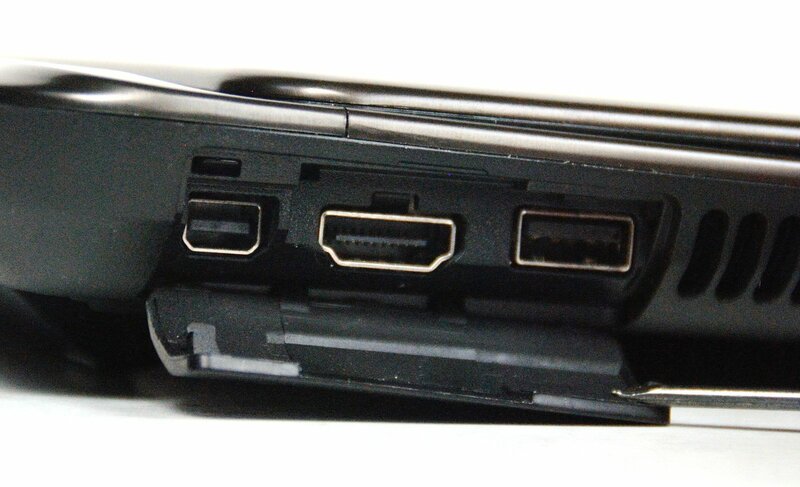 The right side contains the DVD burner, behind which is the combined audio port for headphones or a microphone, followed by two USB 3.0 ports. The interfaces are all located in the rear area in a user friendly way, and don't get in the way of an external mouse on either side. 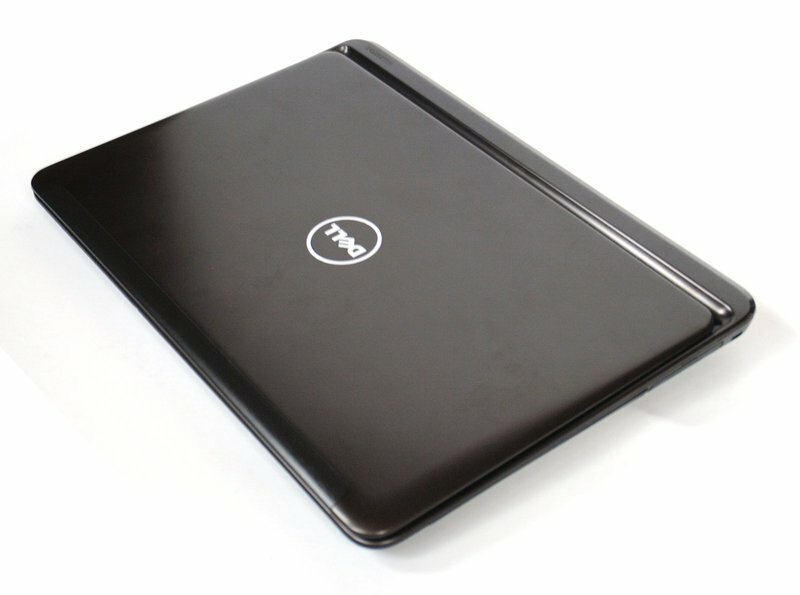 Dell has integrated all the usual communication technologies into the notebook. Among these are Gigabit LAN, Bluetooth 3.0, and WLAN b/g/n. 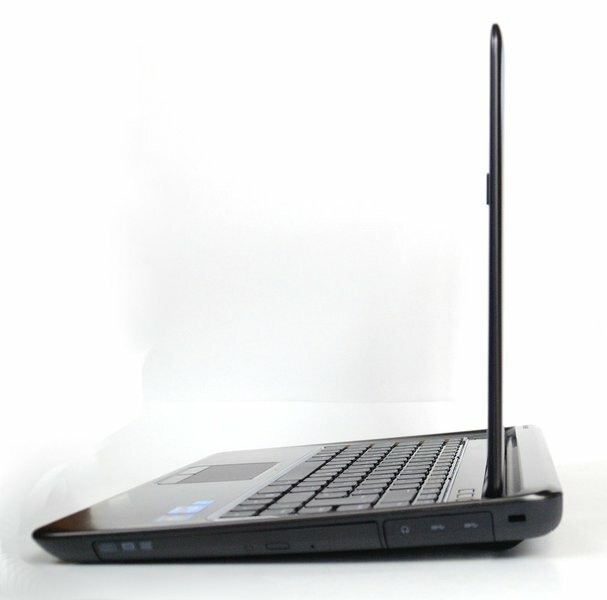 The latter is provided by the Centrino Wireless-N 1030 module from Intel, which can also connect the notebook with a compatible monitor wirelessly using WiDi (wireless display). 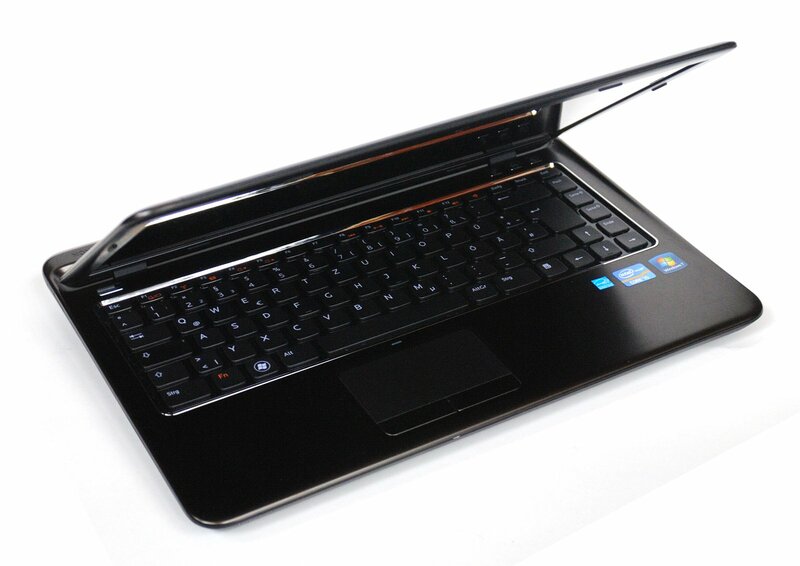 The Inspiron 14z delivery only includes the battery and the AC adapter, and forgoes any other accessories. Due to the omission of the VGA port, the addition of a Mini DisplayPort to VGA adapter would have been favorable. 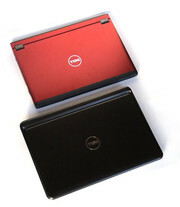 Dell has equipped the Inspiron 14z with a large package of software. This includes Microsoft Office Starter and Skype, as well as Dell DataSafe; with which it is possible to easily make backups and recovery discs, and also to store up to 2 GB of data safely online for free for one year. Similar features are provided by the also included SyncUp from Nero, which allows up to 2 GB of data to be stored and synchronized in the cloud. Furthermore Dell has created its own multimedia suite with the program 'Stage', with which it is possible to view and play photographs, videos and music, and also remote control the software using a Dell Android mobile phone. The standard warranty covers a period of one year. This includes a notebook collection and return service, with a turnaround time of ten days. The service can be extended to up to 3 years for up to 170 Euros, and includes a same day on-site service. Also included with the service is telephone support, which can be consulted for common problems. We are already familiar with the keyboard from the smaller Vostro models, such as for example the V131, which has once again left us with a good impression. Dell has used a chiclet design, hence with separated keys, on top of a shiny keyboard base. This does however gather dust and other dirt which is clearly visible, and is cumbersome to clean between the keys. The keys have a concave surface, and can easily be found and used without looking. Together with the rather short key travel and the good feedback, this is good for typing, and also suitable for longer typing tasks. Unfortunately our reviewed device did not include the optional backlit keyboard. This can be added for an additional 30 Euros in the Dell online shop. The start button and three additional buttons on the right above the keyboard are also reminiscent of the Vostro V131. The left of these buttons opens the Windows Mobility Center, which provides an easy to use way to set several configuration options. The middle button opens the Dell Support Center, which provides the warranty and service information details. And the button on the right can be assigned to a specific function by the user. 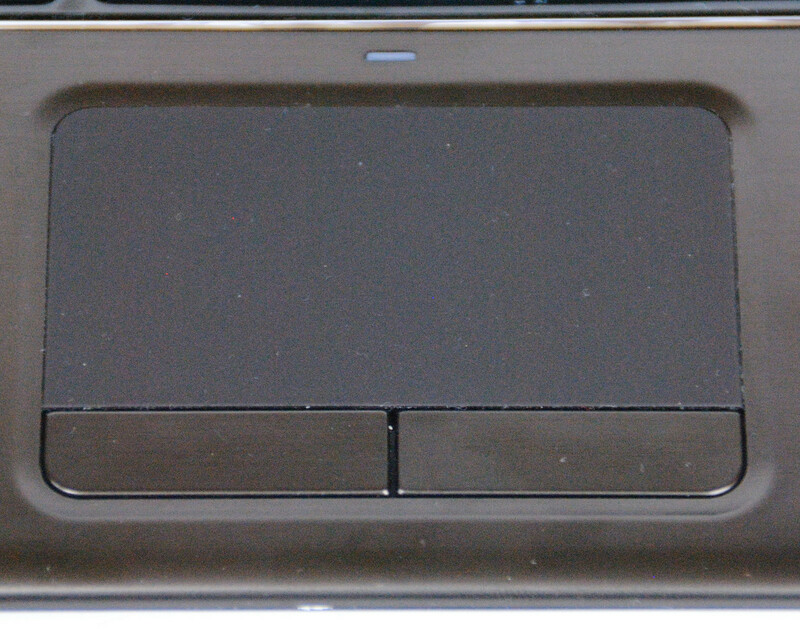 The integrated touchpad is a different model from that used in the Vostro notebooks. A step in the wrong direction in this case, since the touchpad is not clearly separated, and fingers can miss the sensitive region by accident. The touchpad itself is precise, and has good gliding properties. 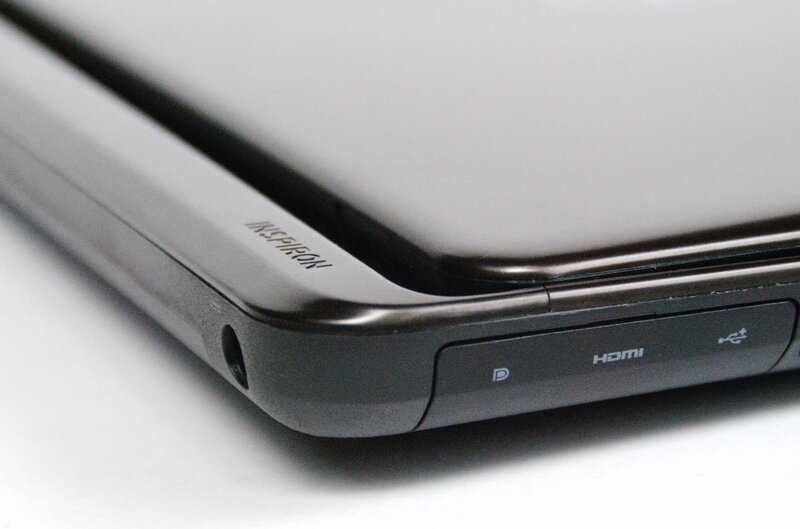 The touchpad buttons in contrast are relatively stiff, and can only be easily pressed in the middle. At the edges the buttons only react in response to a lot of pressure. During the review this led to several cases when we had to repeat clicks. Dell may not allude to this fact directly, but the integrated 14 inch display has a very narrow frame. Thanks to this a 14 inch display could be attached to the base of a 13" base unit. 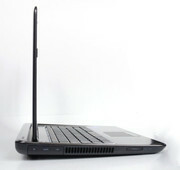 Thus the 14-inch Inspiron 14z has similar dimensions than a 13 inch notebook, such as the Vostro V131. The display is made by AU Optronics, and has the manufacturer description AUO303C. 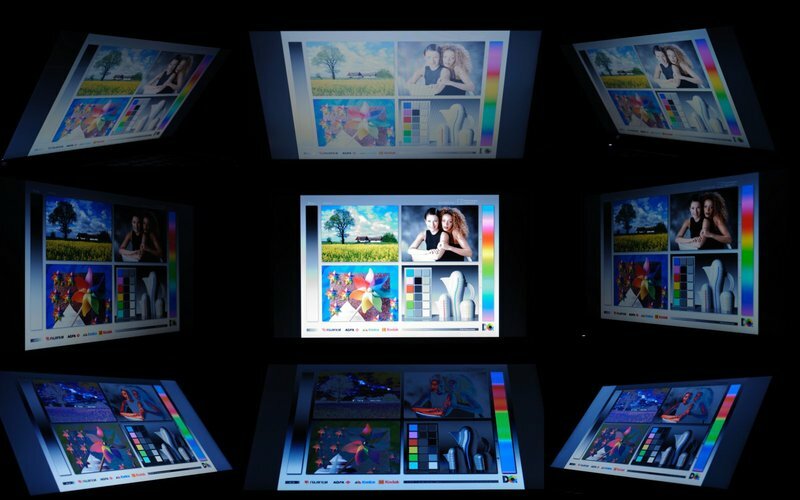 The resolution spans 1366 x 768 pixels, and the display unfortunately has a reflective surface. The reflective display has an average brightness of 176.7 cd/m². A value as bad as this may be sufficient for use indoors, but is unlikely to be good enough for use outside combined with strong reflections on the surface of the display. The distribution of brightness of 85% is still acceptable, even if the brightness reduces towards the bottom of the screen. The black level of 1.3 cd/m² is relatively low, and, together with the low brightness, leads to a meager contrast ratio of 141:1. As a result, the primary consequences are likely to be matt images with weak colors. 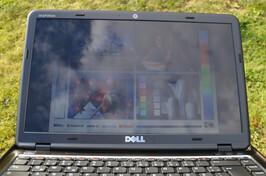 ...the Inspiron is not suitable for outdoor use. 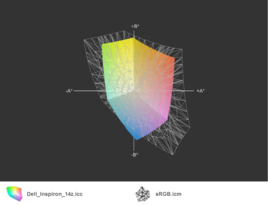 As expected, the consumer standard display isn't able to even nearly cover either the sRGB color space, or the considerably more extensive AdobeRGB color space. This criteria is however only particularly relevant for professional photograph and image editors. 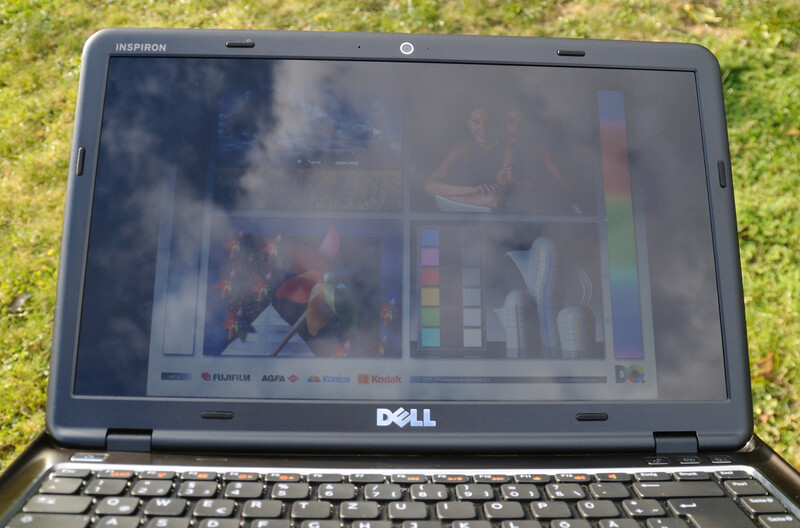 The Inspiron 14z doesn't exactly stand out for having good viewing angles: On the horizontal plane the colors may remain relatively stable, but the images becomes much darker at wider viewing angles. Looking from the side from below the colors invert and darken very quickly. Surprisingly, the view from above is relatively good with the colors remaining recognizable, although the brightness is also lower in this case. The Dell Inspiron 14z can be equipped with one of three different processors from the second generation of the Intel Core series. These include the weaker i3-2330M, and the more powerful i5-2410M and i5-2430M processors. The only graphics option is the Intel HD Graphics 3000 integrated in the CPU. Hence a dedicated GPU is not available. The RAM options include 4 GBs, 6 GBs, or 8 GBs of DDR3 RAM. For the storage of data, Dell provides a 640 GB hard drive with 5400 rpm, or a 750 GB hard drive with 7200 rpm. Also included is a DVD burner, as well as the standard 6 cell battery. Optionally this can be replaced by a 4 cell battery. Using the smaller battery allows the notebook to lie flat, and gives a thinner impression. 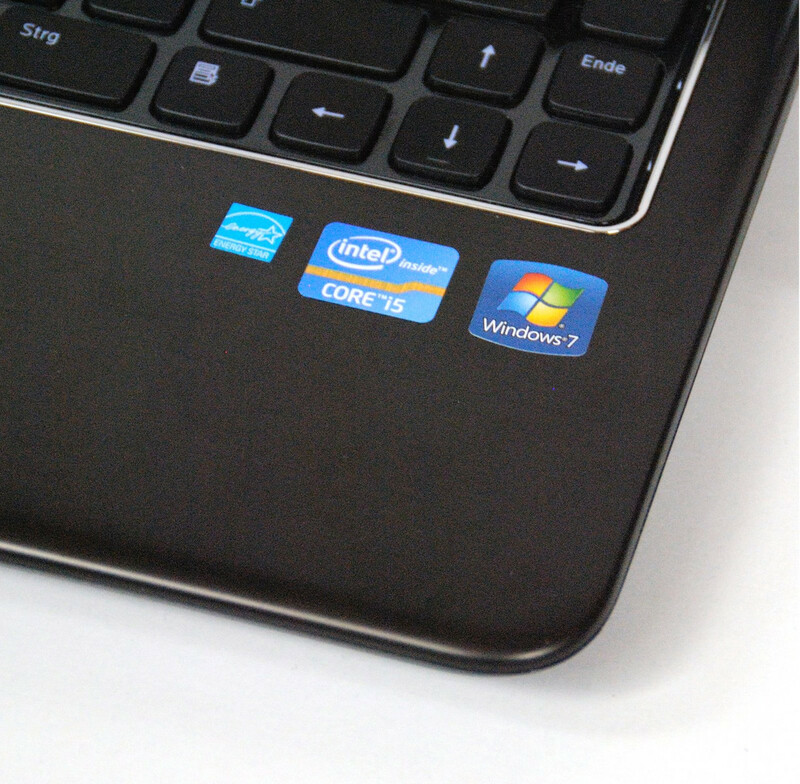 Our reviewed model is equipped with the currently relatively little known Intel Core i5 2430M. This processor's base clock speed of 2.4 GHz is marginally faster than that of the popular Intel Core i5 2410M, which operates at 2.3 GHz. Furthermore, our reviewed model is also equipped with 8 GBs of 1333 MHz dual-channel DDR3 RAM. 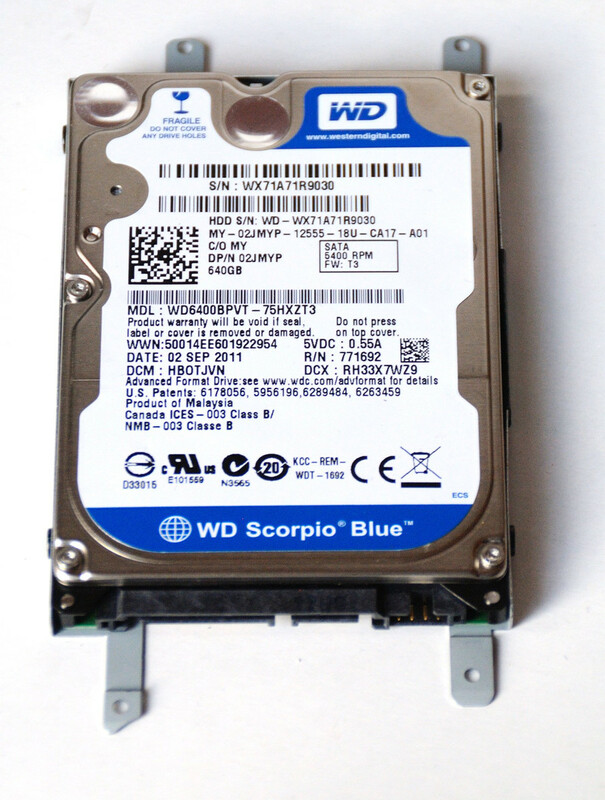 The hard drive made by Western Digital, and has the manufacturer code WD6400BPVT. As the name suggests, this has a capacity of 640 GB, and a rotational speed of 5400 rpm. Using the Cinebench benchmark, the CPU is assessed according to different renderings. 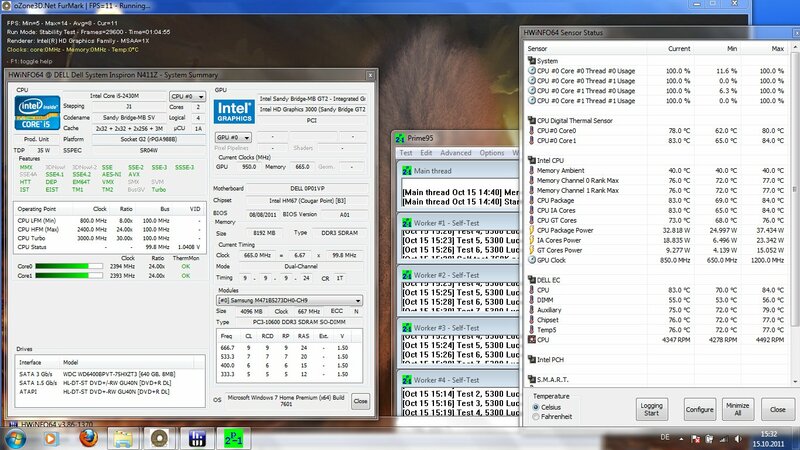 In this case the Intel Core i5 2430M disappoints a little, since it is hardly any better than the popular Core i5 2410M. In some cases the results are even lower than those achieved by a few notebooks with the supposedly weaker 2410M. With a 9715 points score using Cinebench 10 rendering multi 64-bit, the Inspiron achieves approximately 70 points less than the Lenovo ThinkPad Edge E420s-NWD4NGE (Core i5 2410, Radeon HD 6630M), but about 150 more than the similarly equipped Dell Vostro V131 (Core i5 2410, HD Graphics 3000). The cause of the disappointing results can be attributed to the varying CPU clock speed. Although the processor reaches the possible 2.8 GHz temporarily, the Turbo sometimes reduces to 2.5 GHz, and stays at around 2.6 - 2.7 GHz on average. In this case the usual cause of temperature throttling due to a lack of cooling is not the culprit, since the temperature of the processor merely reaches 70 °C. The PCMark benchmark from Futuremark determines a score for the whole system, and does this by simulating typical use. 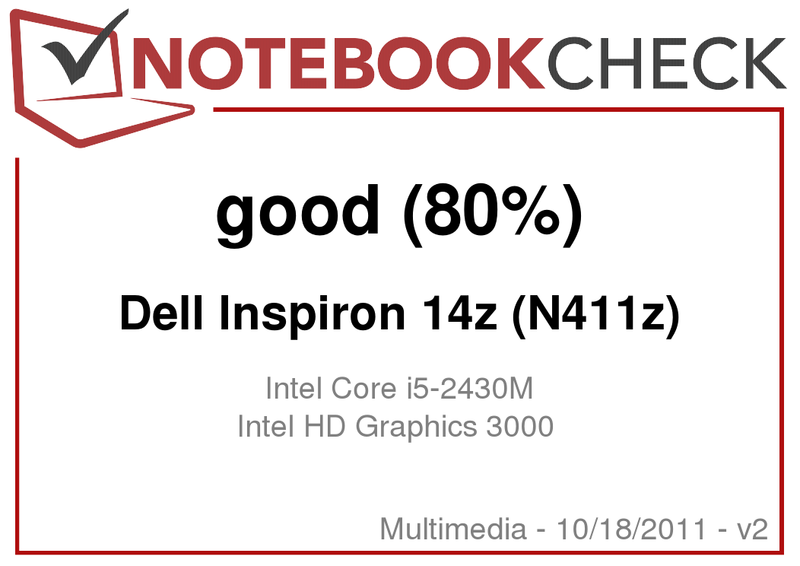 The Inspiron doesn't stand out in this case, but still achieves relatively good results. With 6806 points in PCMark Vantage, it achieves 250 points more than the Lenovo ThinkPad Edge E420s, but also 930 points less than the similar Dell Vostro V131 with a Core i5 2410. This is primarily the result of the relatively low HDD score of 3443 points. The hard drive made by Western Digital has a capacity of 640 GB. It's a slower variant with 5400 rpm. Therefore we don't expect any exceptional data transfer rates. Considering the rotational speed, the hard drive still performs relatively well, and achieves an average transfer rate of 68.5 MB/s with HD Tune. With an access time of 19 ms, the HDD has an average performance in this respect. In light of these facts using an SSD would definitely improve the performance of the system considerably. Graphics processing in the Inspiron is performed by the Intel HD Graphics 3000 integrated in the processor. With a good 3965 points in 3DMark 06, and an also decent score of 1785 points in 3DMark Vantage, it is able to surpass almost all other notebooks with the same graphics solution. Much better scores are nevertheless scored by dedicated graphics cards, such as the popular GeForce GT 540M from Nvidia, which commonly outperform with at least twice as many points. The Inspiron is hardly suitable for playing demanding games. Due to the omission of a dedicated graphics card, the graphics processing power of the notebook is not sufficient for playing games such as the tested DiRT3 smoothly, even with minimal settings selected. Battlefield Bad Company 2 could be played with an average of 38 fps, but was not enjoyable as the frame rates temporarily fell to 11 fps at times. Using higher settings is more or less impossible with both games. In an idle state the Inspiron remains relatively quiet, and the system noise stays between 31 and 34 dB. The cooling fan turns at a consistent rate, and is overshadowed by the slightly louder hard drive with 32 dB. The DVD drive makes itself noticeable with a clearly audible 38 dB, and can be disturbing during quiet movie scenes. With a high processing load the cooling fan turns up considerably, and we measured up to 45 dB. For a maximum level this is still an acceptable value though. When it comes to the temperature, the Inspiron 14z in contrast stands out in a negative way. While a 37 °C notebook can be pleasantly warm during the upcoming winter months, 52 °C during the summer on the bottom of the notebook when fully utilized, can be a cause of concern for the notebook as well as the user. In an idle state on the other hand, the notebook stays relatively cool on the top surface. With a maximum of 29 °C the notebook is merely lukewarm. Especially the area above the DVD burner stays cool. The bottom of the base unit is already relatively warm in an idle state however. In the middle at the back the notebook reaches a temperature of 37 °C, which falls to 31 °C towards the front. To the right under the optical drive, the notebook stays cool and only gets 4 °C warmer than the surrounding area. On the left under the cooling vent, the notebook reaches a maximum of 31 °C. The notebook gets very warm with a high processing load, which leads to temperatures of 52 °C on the bottom of the base unit. The top surface temperatures still remain within limits, and only reach 37 °C. During our stress test the processor and graphics card are fully utilized for at least one hour. In this case the cooling system is also put to the test, since the processing speed is automatically reduced if the temperatures of the components become excessive. The temperature of the CPU stays within acceptable limits during the benchmarks, and doesn't exceed 85 °C. At the beginning of the stress test Turbo-Boost is still active, and the Core i5 uses the maximum available clock speed of 2.7 GHz. However, already a short time later, the clock speed varies between 2.7 and 2.6 GHz, and after about 15 minutes the base clock speed reaches 2.4 GHz. The dreaded throttling which is apparent with some of the current Sandy Bridge notebooks fortunately isn't activated. The speakers in the 14 inch notebook are surprisingly good. The high and mid-range frequencies sound very good even when the volume turned up, and only distort marginally with very loud sounds. Bass is unfortunately also absent with this notebook. Watching a movie without an external sound system is possible since the internal speakers are loud enough. Users that have high standards in terms of audio quality will nevertheless not get around using a good pair of headphones or external speakers. The power consumption is on an expectedly low level thanks to the graphics solution in the processor. In this respect the power saving mechanism in the Intel Core i5, which throttles the clock speed down to 800 MHz when the processing power demands are low, plays an important role since significantly less power is consumed as a result. With a minimum power consumption in an idle state, the notebook is very economical. The maximum value without a high processing load was also measured as an equally very good 10.8 Watts. This is even better than the similarly configured Vostro V131 from Dell, although this has a weaker processor with the Intel Core i5 2410M. With a high processing load the notebook remains just as economical, since an average value of 42.8 Watts is identical to that of the Vostro V131, and is even about three Watts lower than the peak power consumption. 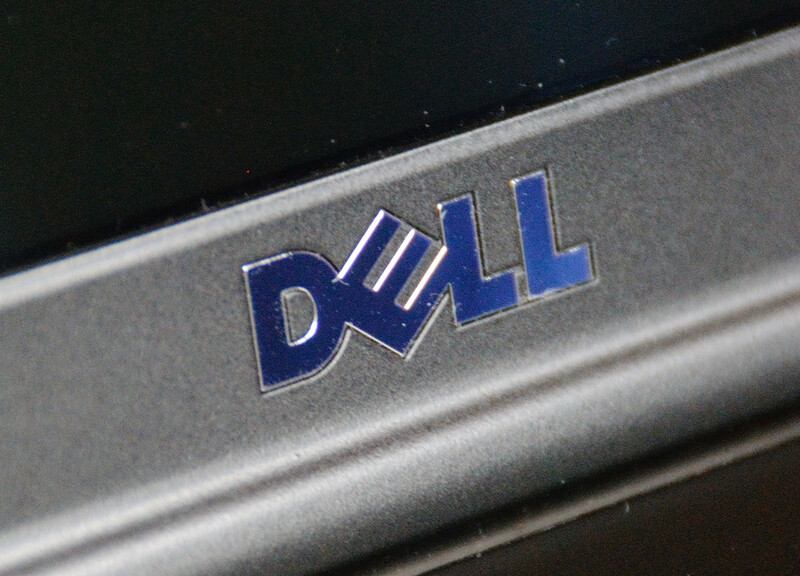 Dell has opted to use a very big battery in the Inspiron 14z. As standard a 6 cell battery with 65 Wh is included. 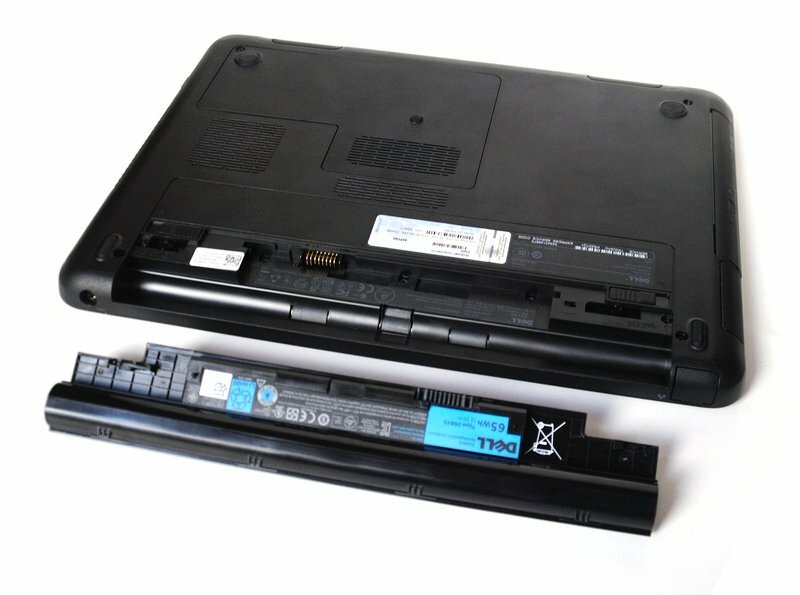 This battery stands out at the back by about 10 mm downwards, and lifts the notebook up. The same battery was already used in the Vostro V131, and the included AC adapter is also identical. Optionally a 4 cell battery with 44 Wh which doesn't protrude is also available, allowing the notebook to lie flat. The large battery pays off though, and manages to keep the notebook on its legs for over ten hours. This long battery life is however only achievable in an idle state, with all the power saving features enabled, and with WLAN switched off. The time was determined using the Battery Eater Reader's Test, which simulates the reading of a text document with a low brightness setting. Far more practical in contrast is the WLAN surf-test, which measures the battery life while surfing the internet over WLAN. In this case the notebook managed to last for almost 7 hours. Impressively, the Inspiron 14z manages to play DVDs for almost five hours. This could be enough for two or three DVDs back to back, depending on the length of the movies. In this case the display brightness was set to maximum, and WLAN was switched off. 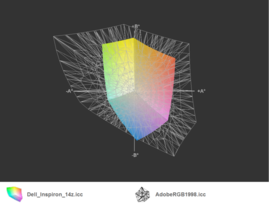 With the Battery Eater Classic Test, a 3D file is rendered while fully utilizing the processor. In this scenario the notebook still managed to last for a good 110 minutes. Dell has done a many things right with the Inspiron 14z, which is an attractive notebook assuming the extraordinary design appeals to your taste. 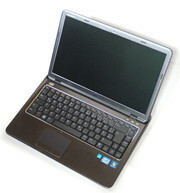 The stability of the Inspiron is good, and merely the manufacturing quality could be improved. Dell has been generous when it comes to the interfaces, considering that there are two USB 3.0 ports, as well as a Mini DisplayPort. All the interfaces are also located towards the back of the notebook, which is an additional advantage. The keyboard is very good for typing, and can also be backlit as an additional option. 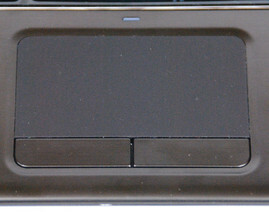 The touchpad is precise and has sufficient dimensions, although it is not clearly separated from the surrounding area. 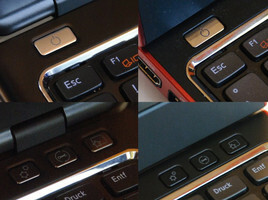 The touchpad buttons are very difficult to use, and don't react at the edges occasionally. The display is unfortunately a consumer quality panel, and has a low brightness with a less than ideal black level, and a correspondingly weak contrast. 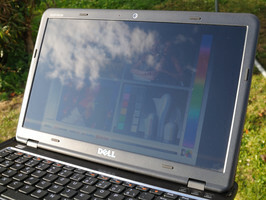 Combined with the reflective surface of the display, these features don't make the notebook well suited for outdoor use. The integrated CPU from Intel is powerful enough for most day to day tasks. The integrated graphics solution in the processor, is relatively good compared to entry level dedicated graphics cards, but struggles compared to mid-range graphics cards such as the Nvidia GeForce GT 540M. For this reason the notebook is not well suited for playing demanding games. The system noise is good to average, and shouldn't be disturbing during normal use. The temperature on the other hand can reach relatively high levels. The maximum measured 52 °C is probably too hot for use on a lap, but during office use this shouldn't be a problem. The speakers are surprisingly good and sound far better than those in the Vostro V131. Thanks to the intensive power saving features of the Intel CPU, the Inspiron is able to score points when it comes to the power consumption as well as the battery life. The longest measured battery life lasted for an impressive ten hours. This is however primarily due to the large battery, which stands out at the bottom of the notebook, and lifts the notebook up at the back. Despite its 14 inch display, the notebook could easily pass as a 13" device thanks to its compact dimensions. This makes it very portable, while the long battery life allows it to be used for lengthy times without having to connect the power cable. Those looking for a notebook such as this might well have found the ideal candidate. ...as well as the same battery. The Inspiron 14z is also available in 'Fire Red'. ...which is very well equipped with 65 Wh. The hard drive can be changed very easily. Only four screws have to be removed. 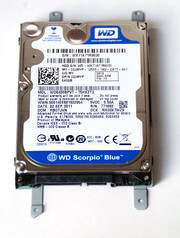 The current model is made by Western Digital, and has a 640 GB capacity. Changing the RAM is also very easy. Status LEDs on the left side at the front. ...an Intel Core i5 2430M processor. ...such as the Ethernet port for example. Ports are better protected thanks to this. HD webcam above the display. ...and only 25 mm thick without the battery. The speakers are underneath the notebook. The large selection of interfaces, the good keyboard, and the long battery life. A non-reflective display with more brightness, and good touchpad buttons. The covering of the ports - added benefit or annoying over time?